SeaWorld Camp Internship offers college undergraduate students an opportunity to work with middle and high school students at Camp SeaWorld in Orlando, Florida. This paid internship is for college students majoring in education, science, and recreation. Students eligible for the internship must have completed their sophomore year in college, be in good academic standing, and be certified in CPR. The internship involves working with animals and teaching camp residents about animal life and marine science. Interns will be responsible for programs that teach camp residents of all ages. The internship was designed for college students in education and science to help teach others how to appreciate science and respect animals. The work of interns helps to increase a knowledge of math and science in school students. College students accepted into the internship program will not only receive pay but also may receive academic credit for completing the internship. The internship program is sponsored by the Education & Conservation Department at SeaWorld Orlando. 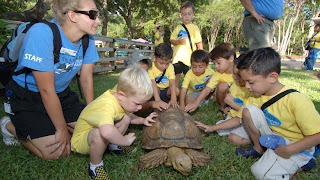 SeaWorld offers several camps for youth, including resident camp for grades 4-college, day camps for children in pre-K through grade 8, group camps, and sleepovers for grades 2 and above that give children an opportunity to spend the night inside the park.